As an avid fan of Lonely Planet which preached the spirit of spontaneity, I am always about straying into uncharted (or, in this case, unreviewed) territory as I explore new places. Sometimes, the mere act of hunting down a place to have dine out at a particular area is so exhausting, it took more time then the meal itself. So during my Sunday’s excursion to Shatin and Taipo, imagine my surprise to discover a vegetarian restaurant right at the top of hill, in the midst of the complex of temples. Then again, why should I be that surprised? With the number of tourists thronging around, someone gotta give them food, especially after the hike up the 400 odd steps. It can be grueling during summer days. But to my (other) surprise, this place has not been reviewed on OpenRice.com. And not even on vegetarian websites. 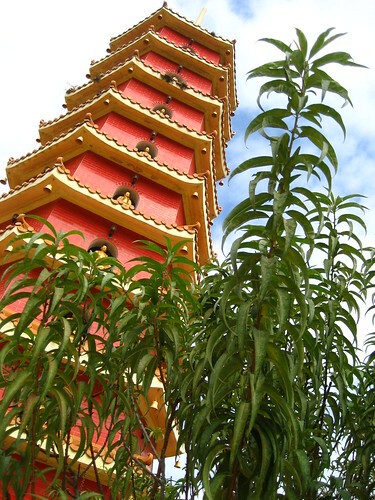 So here I am to introduce you to the pleasant discovery of Vegetarian Restaurant At The Ten Thousand Buddhas Monastery at Shatin. The restaurant itself looks more like a school canteen than actual dining establishment. Not that it was not pleasant. On the contrary, I was comforted by its cleanliness and spaciousness. Tables were placed with sufficient space between them, so that you won’t feel like you are having a meal with the strangers at the next table. The windows were opened wide to take advantage of the mountain breeze, and that was a definite welcome change to your average stuffy and/or dingy Hong Kong restaurants. Ordering was also a breeze. All you need to do was to choose dishes from a list of ten choices. 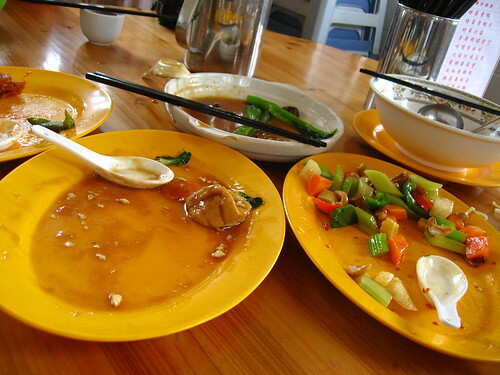 Each dish cost you HK$60, and if you share one dish with another person, you’ll need to pay another HK$10 for his tea. This dish was impressive not because of taste but of the variety and freshness of ingredients within. 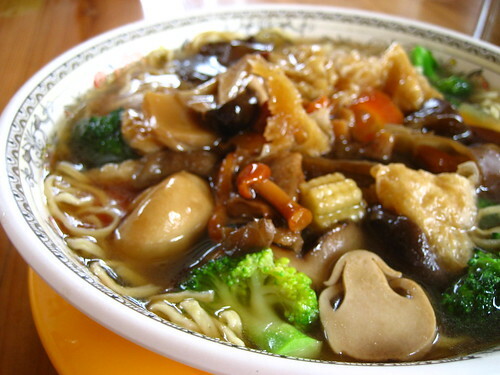 Lo Han style dishes are often cooked with mushrooms, broccoli, baby corns and beancurd, and this dish aced throughout without overwhelming you with MSG or salt. In fact, I suspect the taste was a result of NOT using any MSG. The noodle was slightly overcooked, but when soaked with the thick gravy, you won’t notice it unless you were paying particular attention. 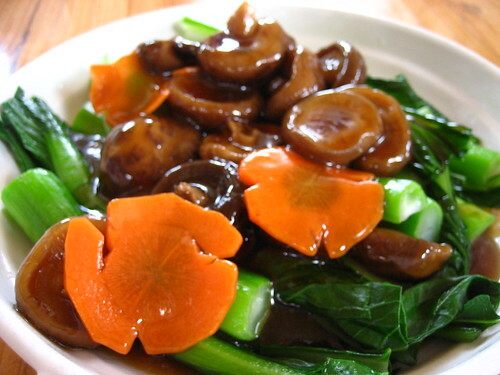 Some time I find it weird to order vegetable dishes from a vegetable restaurants. I would think for the money you are spending on vegetarian meals, you would go for the mock-meat variety. 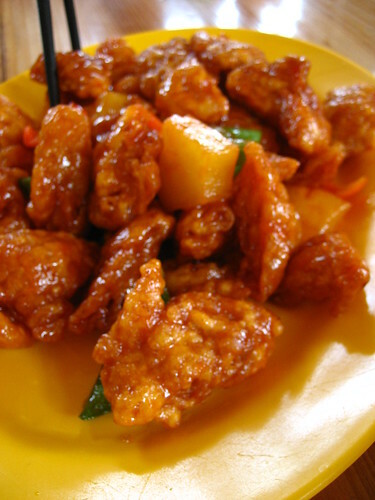 But this dish, as common as it is on Chinese menus, was worth the price tag. Did they harvest the mushrooms from the mountainside? Coz it certainly tasted fresh as if they were. Or probably that’s only the mushroom fanatic in me speaking. Easily the star of lunch that day. To be honest, for a mock meat, I thought they were meant to be pork instead of chicken. But that’s besides the point. From a mock meat perspective, the crunchy fillet certainly fooled our taste buds. I felt like I am feasting on a particularly good dish of “gou lou yook” (which is the pork rib variety with the same sauce). It’s delicious, the sauce wasn’t that sour, and the pineapple! Can only be described as juicy slices from heaven (P.S. I seem to use the word “heaven” a lot in food reviews, but under the circumstances of this meal, I think it fits). I don’t think anyone was too embarrassed in picking up the last piece. Oh, that was just me. Coming a close second to be the star of lunch was this crunchy delight of a dish. 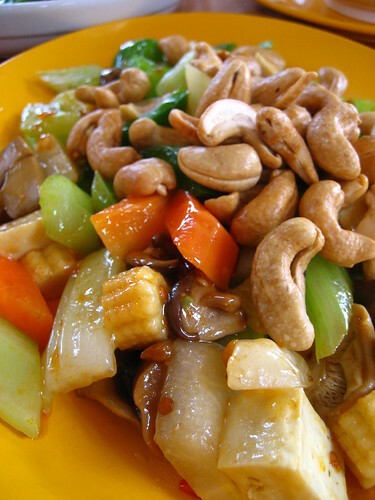 It got to be the most generous serving of cashew nuts I have even seen in similar dishes; the diced vegetables (baby corns, celery, and other usual suspects) were smothered underneath. The taste? A dish not to be missed, that’s my advice. If you are a cashew nuts lover. Especially if you are a cashew nuts lover. How do you know when a meal was indeed good and not just merely “above average”? What I would never touch again? Honestly? None. All dishes worth by their own merit. The restaurant alone is worth the hike up the hill. If you are vegetarian lover, don’t miss out. Make your way to Shatin now. Those dishes look really nice. Legolas – Are you a vegetarian food lover?